9.5x8.5x3.5 in - 4 kg. Antiqueted brass sculpture reflects the very spirit of India and proclaim her rich and varied ethnic diversity. The brass, carved out into figures or figurines, is finished to give an antiqueted look and then colored and polished to give it its arty touch. The sculpture here is a painstaking representation of the Ram Darbar, giving us a glimpse of the handsome Lord Ram giving darshan along with his consort and brother, Lakshman. Ram, one of the dasa avatars (ten incarnations) of Shri Mahavishnu, holds his huge bow on his Ajanu Bahu (strong shoulder), while he blesses his devotees with the abhaya hasta (gesture showing protection and succor) on the right. Ram is a picture of peace and shanty (serenity) as he blesses all his devotees. 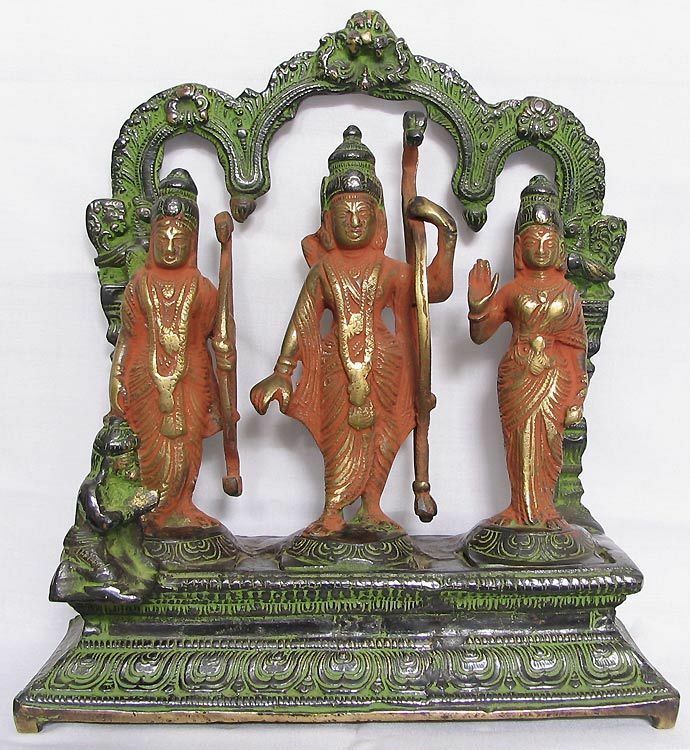 His consort, Sita, stands at his left side. The delicate Devi also showers her blessings on all those who bow down to her. Ram's brother, Lakshman, stands on his right side and is ever ready to act as per his brother's orders. Ram's faithful attendant, the mighty Hanuman, sits at his feet with devotion.